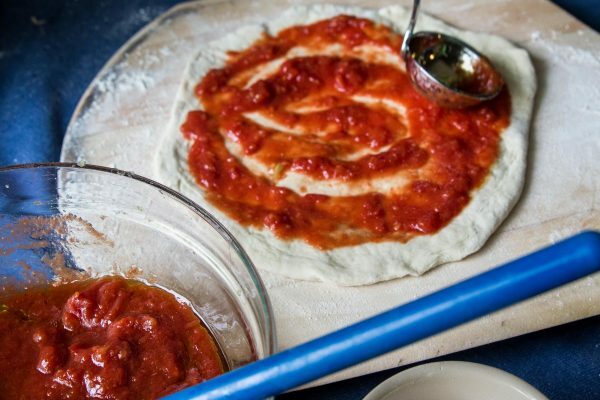 You don’t need a lot of ingredients for pizza sauce. In fact, the simpler the better. That’s pretty much our philosophy for all pizza. If you are looking for barbecue chicken and pineapple. Sorry wrong place! You’ll get better, fresher flavor, with a simple combination of ingredients. Use good tomatoes and good cheese! Believe it or not, it’s enough for our 6-pie dough recipe. Packages of whole milk or fresh mozzarella that you cut yourself are the way to go. Just chunk the cheese up roughly into slices with a knife. Pre-shredded mozzarella, while convenient, really lacks flavor. Combine all the ingredients in a bowl. 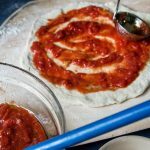 Use a small ladle or big spoon to coat the stretched dough on the peel. One 28-ounce big can works great.